Before we dive into any details on air sealing and insulation, it’s important to understand the basics of building science and how your home functions as a system. By understanding building science, stack effect, and how heat is transferred we can more effectively address and improve your home’s energy efficiency. Stack Effect is the movement of air in and out of a building due to differences in air density, temperature, and moisture between the inside and outside of the building. Warm air is less dense than cold air so it will naturally rise above cold air. Cold air is more dense, so it falls and moves from outside into a heated building where the air is warmer and less dense. Now, let’s apply this knowledge to your home. During heating season in the winter, warm air inside your home is going to naturally rise. As it rises, it is going to seek out any small crack or crevice with the path of least resistance in order to escape from your living space and into the attic. As that warm air is exiting the home, a negative pressure is created in the lower levels of the home that draws in new air from the outside. The new air typically gets sucked in through any cracks or gaps in your basement. As that air enters your home, it begins to get heated and starts to lose density which makes it rise. 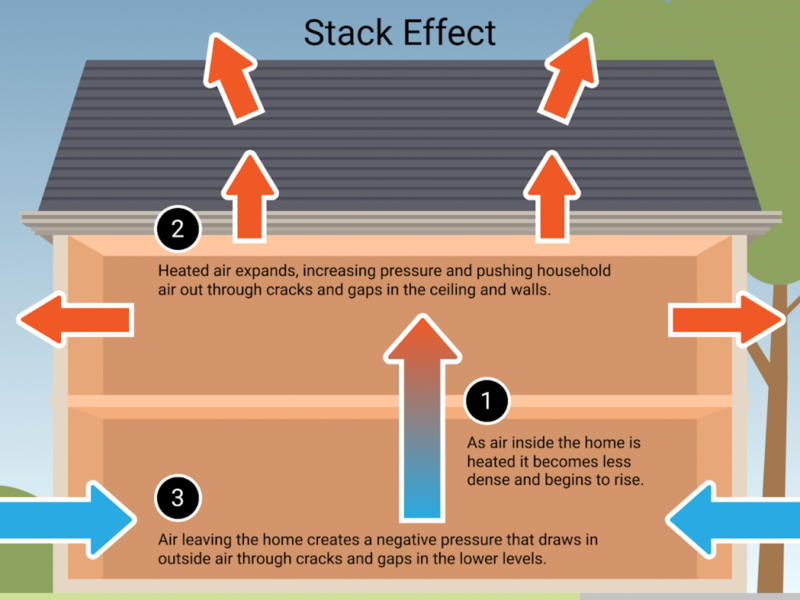 That continuous motion of air is called Stack Effect or Chimney Effect. Contact us today to schedule a no-cost Home Energy Assessment to see how the Mass Save program can benefit you! We're available by phone, and email Monday to Friday 8am to 5pm. Copyright © Green Collar Inc. All rights reserved.